I've discovered that baby hats are the perfect de-stasher. I bought this Berroco Comfort DK to make Clare a sweater and decided I didn't like the color mixture I picked. I have about 9 skeins of different pastel colors so I figure I'm set for baby hats ..well.. forever. 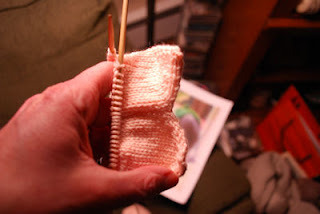 It's interesting knowing that I need to knit two this time because we don't know what baby # 3 is going to be. This is my first one... very girly. Now I just need to find a cute one for a boy. I tend to go toward the nautical for boys. But my daughter doesn't. She's not punk rock or anything, but I think she would like one with the little skull and cross bones on it. That seems to be the "in" thing for little boys these day. Projects? Yep, I got em. A simple toque hat made with hand spun I purchased at Maryland Sheep and Wool. This is for me. I'm going to call it my "digging out my car" hat because that's probably the only time I'll ever wear it. 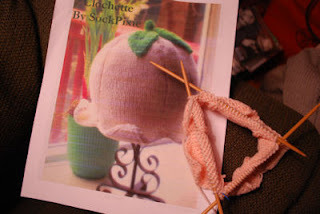 I don't have the name of the pattern with me, but if you Google "pattern hat canadian toque knit"... it comes right up. Free pattern. Below is the Button Cable Wrap by Erika Flory. 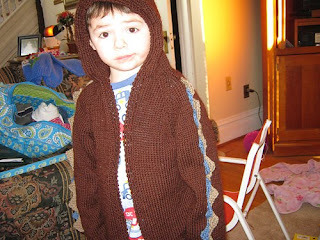 (also for me :) I found this on Ravelry.. free pattern. 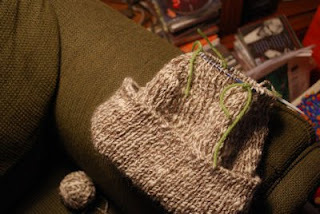 I'm knitting it in Universal Yarns Deluxe Worsted and I'm loving the yarn. In other exciting news I had my first digital photography class last night. As you can see, I'm experimenting with no flash indoor photos. I guess I'll master it eventually. 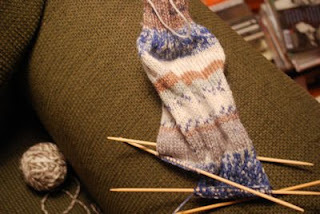 I'd love to be able to photograph my knitting a la Jared Flood. Check it out at www.brooklyntweed.blogspot.com. But of course, I'm a lot more interested in photographing my grandchildren! I just need to put the zipper in... well, HAVE someone put the zipper in, and it's finished! I think he likes it. I'm not sure.